Red-Tailed Hawk (Buteo jamaicensis) patrols the skies over a wetland area in Medina County, Ohio. This Sunday afternoon was chilly but the sun shown brightly, so I ventured out on a photo walk. I was seeking Sand Hill Cranes that had been sighted at the wetland restoration area of Buckeye Woods Park, Medina County, Ohio. I saw no cranes but did enjoy a flyover by a beautiful Red-Tailed Hawk (Buteo jamaicensis), a loud concert by Western Chorus Frogs (Pseudacris triseriata), and the sight of a tree full of migrating Tree Swallows (Tachycineta bicolor). A nice way to spend an April afternoon. A Tree Full of Tree Swallows. Migrating Tree Swallows (Tachycineta bicolor) take a rest along the open waters of the Buckeye Woods Wetland Restoration Area, Medina County, Ohio. Sunday night, March 18, was to bring a lovely sight to our western sky: a conjunction of a very thin crescent Moon, with planets Venus and Mercury. I arrived at the Medina County Park System’s Letha House Park, where I have after-dark privileges, about half an hour before sunset. I was a bit disheartened when I saw the entire western sky covered with a mixed pattern of cirrus clouds. I thought, “Oh, well, even if I can’t see the Moon and planets, it should be a spectacular sunset!” I need not have worried. Move! A Canada Goose lands behind another on waters lit by sunset, urging it to move along. While I waited I was delighted by the evening songs of hidden birds. That sense of peace was shaken by Canada Geese, jostling for nighttime position, squawking and chasing each other in the air and on the waters. The geese provided me with entertainment and some lovely scenes of sunset-lit ripples and splashes. Blue Conjunction. The setting Moon and planets float in skies that changed in color before finally fading to night. As the Sun sank below the horizon, the clouds thinned considerably leaving some streaks floating in the light, reflecting in lake waters. The sunset, while beautiful, wasn’t as spectacular as I might have expected but suddenly the Moon became visible, then Venus, and finally tiny Mercury — and brighter than expected. Colors of Twilight. Left to right: Moon, Venus, and Mercury, in conjunction, sink in the tree-edged western sky. So, I shot many photos, changing exposure and composition, and captured a few images I rather like. I was a bit surprised and disappointed with the captures from the Canon 7D Mark 2 camera (a “crop sensor” camera) — they came out “grainy,” even though I stayed with ISO 400 for the whole shoot; that’s the camera I typically use for wildlife shots, not scenics, and I normally don’t see the grain. The full-frame Canon 6D performed very well (its images are typically “smooth”) though I wish I would have increased my exposures — too many were too dark and not recoverable — I’ll blame that on trusting the camera’s built-in LCD panel whilst judging exposures. The LCD, of course, looks brighter in the dark tricking my eye! Parting Shot. The Moon, and Company, sink into clouds and trees to disappear for the night, their light reflected in dark lake waters. Still, in all, a beautiful night for a gathering of Moon, planets, and sky. Sunset-brilliant orange ball sinks below the treeline ushering in darkness for stargazers. On Saturday night, July 29, I headed out to the Medina County Park System’s Letha House Park for a little stargazing and photography. The Cuyahoga Astronomical Association was hosting a public star party and it seemed a good occasion to try some Milky Way photography from their “dark sky” site. Following a beautiful orange sunset, I shot photos of the assembling sky watchers. I had not planned to shoot photos of the Moon but the waxing crescent dominated the sky with its bright presence. I installed the 2X telephoto adapter to my 400mm lens for a nice 800mm optic. I got decent photos of old Luna but the effort would have benefitted with use of a crop-sensor camera body and its boost in apparent magnification; instead, I was using my full-frame (35mm equivalent) body. I won’t complain too much. The photo looks pretty darned good for an image made on a whim! Waiting for the sky to darken enough for Milky Way images, I spoke with several small groups of people and pointed out objects of interest in the dimming sky. Many folks had never looked through a telescope before and were thrilled to be doing so that night! Others were excited to learn the names of a very few constellations, and to see the emerging Milky Way. One couple asked whether I’d ever seen strange, unexplained phenomena in the night sky (UFOs, etc. ): strange and wonderful, yes; unexplained, no. It’s a little surprising how many people ask, however. Sky dark enough, I started recording images of the sky. I used a simple photographic tripod, a 15mm diagonal fisheye lens, and my full-frame Canon EOS 6D, wide open at f/2.8, for various lengths of time. The waxing Crescent Moon drown out most of the Milky Way visually – it looked like an area of cloud spread thinly from the south to overhead – but showed up better in photographs. Near the horizon in the photo above, may be spotted the “Tea Pot” asterism of Sagittarius, and constellation Scorpius on opposite sides of the tree (and Milky Way) at center. The bright star above the Moon is Arcturus. The streak of a small meteor is captured with the Milky Way as background. In another shot, concentrating on the Sagittarius area of the sky, I captured a little meteor that I did not see at the time of the exposure! I will definitely want to try shots like this again on moonless nights! Trouble is, however, on the horizon: human-made light pollution! Over the years since the astronomy club built their rural Medina County (Ohio) observatory, light pollution from the city of Medina has grown noticeably worse. My final photo in this post shows just how bad it’s getting. The center of Medina is about 12 miles from the park observatory and the city’s glow is intruding high into the sky. What once was a nighttime glow just above the treeline now extends high above it. City Lights are erasing the night. We are losing the glory of the night sky to the form of human environmental pollution that is probably easiest to control and that provide immediate benefits in doing so: turning off unneeded lighting, directing lights downward where they are needed (uses less light and power), and immediately save energy and money. I hope I don’t have to drive farther away from town with each passing year in search of darker skies. I can hope, can’t I? On a photo walk in the Medina County Parks’ Buckeye Woods Reservation, we happened upon a medium-sized snapping turtle. The turtle had hauled itself out of the water near a small pavilion at the edge of a wetland area; it was likely a female who was on an egg-laying mission. We shot some photos, including this one, and went on our way. After a relatively brief hike, we passed the shelter just in time to spy the turtle trundling back down the bank and clumsily enter the shallow water. This intimate portrait was shot with a long telephoto lens: you don’t mess with snapping turtles! Watching from a small tree, a male Red-Winged Blackbird sits in shade, its red shoulder markings hidden. The Red-Winged Blackbird announced itself from the branches of a small tree nearby. He allowed visitors to approach only so much, then flew off. Repeating. Too close! A male Red-Winged Blackbird rockets from one tree to another. Sunday, October 12, presented us with beautiful autumn weather so we set off to check out an historical open house in western Medina County. The drive out was excellent but the open house itself was a bit disappointing. Heading back along our earlier track we stopped to explore a place She Who Must Be Obeyed noticed earlier: the Chippewa Inlet Trail North Trailhead, a property of the Medina County Park District. 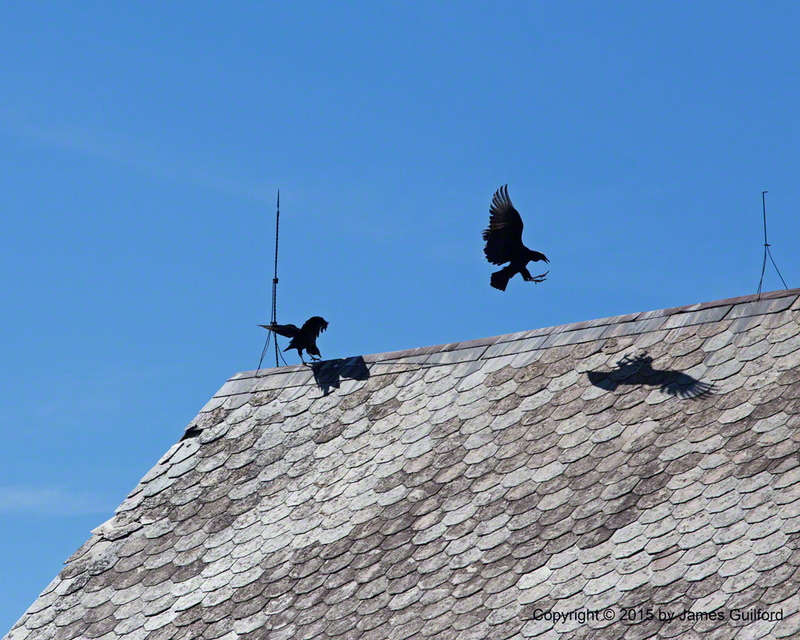 As we exited the car in the parking lot we noticed the distinct silhouettes of four vultures on the fish scale roof of an ancient barn. As I shot photos of the birds I could see that something was different… these were not the Turkey Vultures we so often see around here. The birds danced and squawked along the ridge of the roof and I moved around the barn to see the birds, not as shadowy shapes but lit by the sun. Grey heads and legs, white wingtips on the underside; nope, not Turkey Vultures! Happily, I had my iPad with me and a copy of the Peterson Field Guide: Birds of North America. 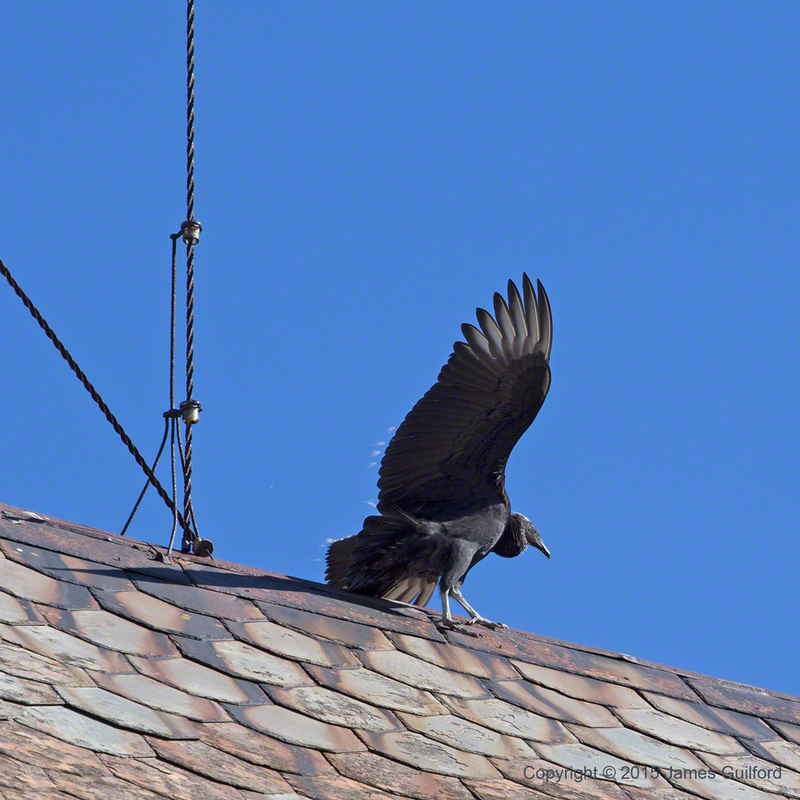 I quickly learned the dark quartet were Black Vultures (Coragyps atratus), and rarely sighted in Northern Ohio! We walked around trailhead area and its beautiful shallow ponds, enjoying the sun and soft breeze. What really made my day, however, was the sight of the Black Vultures against blue skies. On a frigid morning hike in the Allardale Park, Medina County (Ohio) Park District this morning, I happened across a touching sight. 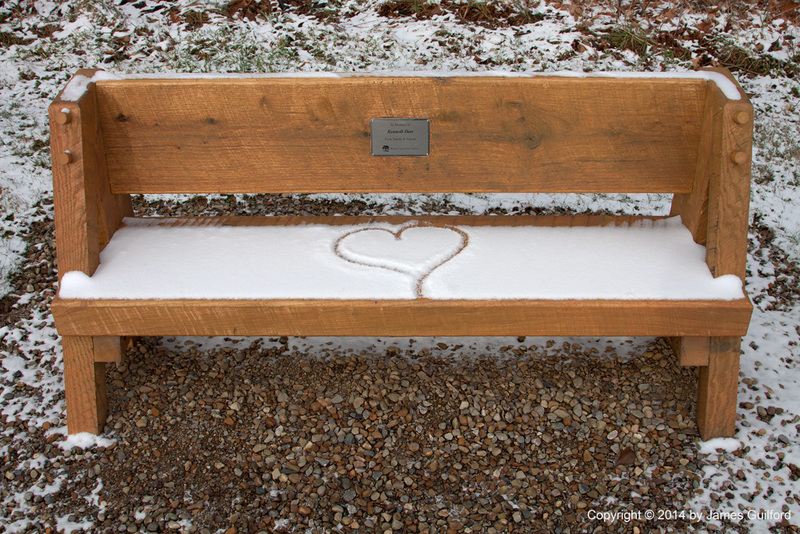 There, on the snow-covered seat of a park bench, someone had earlier used a finger to draw a “love heart.” Sweet enough, I suppose, but then we see that the bench was dedicated in someone’s memory; now this becomes a poignant scene. It turns out the person named had died six months earlier, at age 90. This will be the first winter, the first Christmas, his relatives, friends, and the parks will see without him in a long, long time. That he was loved and is missed, shown in the outline of a Valentine in snow.